I’ve mentioned my fear of needles on this blog before, but I think I implied that I’m over it, and that’s not quite true. The fear is more complicated. Injections don’t bother me much anymore, but any sort of blood draw or IV is still a cause for hyperventilation. When I got my wisdom teeth removed, I planned to be unconscious, but when I arrived on the day of the surgery and learned that general anesthesia would involve an IV, I had a panic attack and opted for lots of local anesthesia and nitrous oxide instead. That was six years ago. Now fast-forward to a couple of months ago. I’d been suffering for several months from a myriad of complaints that were difficult to pin down. I researched. I tried remedies. I tried lifestyle changes. Nothing seemed to help. The general consensus of reliable Internet sources was that if I wanted to get to the bottom of the problem, I would need to get some blood work done. But I couldn’t live like that anymore, so I decided it was time to face my fear. I made an appointment with my doctor and let my husband know that I wanted him to come with me, partially for moral support and partially to drive. That was a good call. I kept my eyes closed for the blood draw, and even then my legs kept shaking. When I put my feet down on the ground to make it stop, that changed the angle of my arm and made it hurt worse. It went on forever. As shaky as I felt during the blood draw, the five minutes after were much worse. The room suddenly felt so hot, and I was sweating. When I tried to stand, I got dizzy, so I sat down again. I thought I might throw up. After a while, the nurse came back to check on us because people don’t usually spend a lot of time sitting in the doctor’s office after their appointments. I joked about my husband carrying me to the car but got there on my own two feet. The hour after that was great. We went home and the initial shock of the experience wore off. I started to feel like maybe I wasn’t about to die after all. I ate lunch with my husband and smiled a lot. He went back to work. I tidied up my kitchen. And then I curled up in a ball on my bed and cried. I don’t know how to explain this, except to say that for the first time in eighteen years, my inner six-year-old was traumatized by an adult taking her to the doctor for a very necessary jab in the arm. Catching up on seven vaccinations at age seventeen didn’t count—that had been the opposite of traumatizing. I’d faced that fear and gotten over it after the first shot. But I’m still terrified of blood draws. If I think about it too much, I can have a meltdown. The weird thing about all of this was that the big, mean adult that dragged me to the doctor wasn’t my mom. It was me. What do you do with that? How do you make peace with a betrayed child when that child is you, and the adult who betrayed her is you too? I opted for the closest thing I could think of to my rational brain giving my emotional brain a big hug and then sending her away on an all-expenses-paid vacation: I read her favorite story. I was nine years old the first time I borrowed Ella Enchanted from the library. Over the next four years, I borrowed it another time or three until I got my very own copy on my thirteenth birthday. I’ve read it again and again. I lost track sometime after eight reads. All I know for sure is that I’ve hit the double digits now and I’m amazed that my paperback is still holding up. The early application of contact paper works wonders. I’ve read parts of this book while perched up in a tree, curled up in a DIY plastic teepee in the rain, lying on the roof of my parents’ house…you get the idea. This book and I are inseparable. Even if I were to get a tiny house and replace my other books with ebooks, I would still want a physical copy of this one. I love it that much. The voice of the narrator. Ella is a spunky, sassy teenage girl. She’s passionate and opinionated. She's funny. Even though she has to obey, she fights it. She’s smart, too; when she’s operating under her own free will, she pretty much always makes the right decision. I even appreciate her moments of mean scorn and arrogance; they make her feel like a real person instead of a Mary Sue. The writing. This book has beautiful descriptions and great character chemistry. There’s a balance of showing and telling that keeps the story interesting and appropriate to the lower YA audience. The world. Ella lives in the kingdom of Kyrria, which is predominantly human, but Ella comes into contact with plenty of other societies. Elves. Ogres. Gnomes. Centaurs. Giants. Fairies. Parrots who mimic a variety of languages. Ayorthians. It’s a big world out there, and Ella’s travels show a lot of it without weird roundabout trips. The structure of the book is spot-on. I’d never noticed this before, but everything from major plot-points to chapter arcs just works. There are even great chapter endings that hook the reader into the next chapter. The best part of all of this is that it seems really organic to the story, rather than artificial and contrived. A lot of hard work went into this book, and it shows through effortless reading. The romance is adorable. In case you haven’t figured it out yet, Ella Enchanted is a rendition of "Cinderella". Gail Carson Levine didn’t like the love-at-first-sight trope in the original story, so she set up several earlier meetings between Ella and Prince Charming Charmont. They have a cute and hilarious mutual interest and a sense of fun that makes them perfect for each other. The romance plot is also integral to the enchantment plot, not a side story. For me, Ella Enchanted will always be a seven-mustache book. No surprises there. There are reasons why it got a Newbery Honor. When I finished Ella Enchanted, I felt a lot better, but my inner six-year-old wasn’t quite ready to come back from her vacation and make up with my adult self. My arm had only just stopped feeling weird and heavy, and the memory was still too fresh for forgiveness, so we read another story. 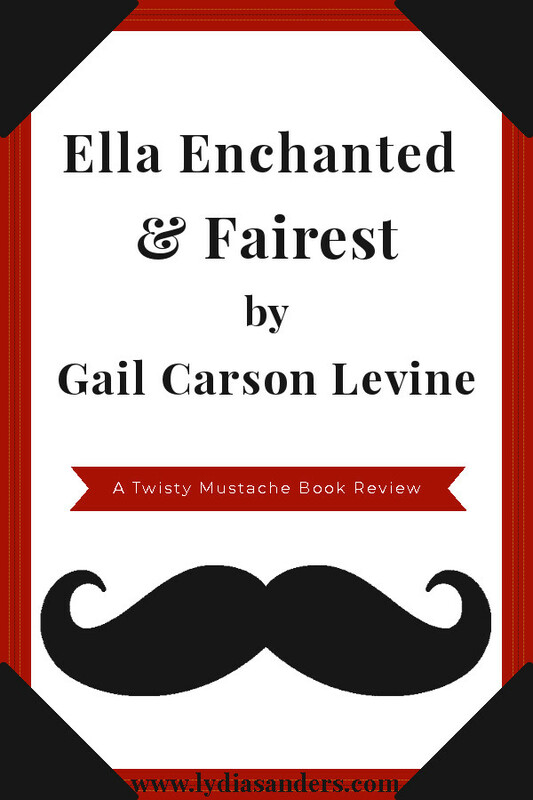 Fairest is a companion novel to Ella Enchanted. It was first published in 2006, nine years after Ella Enchanted the book and two years after the film. Renewed interest following film probably had a role in bringing us Fairest, and I don’t think that’s a bad thing. However, I didn’t discover Fairest until some years later when I was in high school—maybe too late to fully appreciate it. The two books are set in the same world, but aside from Lucinda’s bad gifts and Areida going off to finishing school, they don’t have a lot of overlap. Let’s compare and contrast. The protagonist. Fairest follows Aza, Areida’s adopted sister. Aza is abandoned at an inn as a baby. The innkeeper and his wife raise her along with their other children. In all, her family life is much healthier than Ella’s. However, because their family runs an inn, Aza has to interact with customers and many of them are rude about her “ugly” appearance. This shapes Aza’s character arc for the book, allowing Levine to tackle topics like self-image and subjective cultural beauty standards which are especially relevant to the lower YA audience. Levine keeps Aza’s appearance from totally defining her by giving her voice talents that are prized in Ayorthia. The voice. The author voice is the same, but the character voice is different. Because Aza struggles with her self-image and self-worth, a spunky voice like Ella’s just wouldn’t have worked in this story. Add in her humble and relatively powerless position in relation to the antagonist, and it’s no wonder Aza is serious and melancholy. It’s much harder to pull off humor in a book like this, though there are a few funny moments. One of my favorites involves Aza doing something I totally would have done as a teenager...if I lived in a magical world. The fairytale. Fairest is primarily based on "Snow White", but it also has elements of "The Ugly Duckling". I think that the combination makes this the most original take on "Snow White" that I’ve ever read. For those of us who are already familiar with "Snow White", it makes the plot much less predictable. I also appreciate that Aza is considered ugly in her society. I like it partially because of the themes, but partially because the typical "Snow White" description of ebony black hair, ruby red lips, and snow white skin is an extreme image that I don’t find inherently attractive. The romance. Fairest doesn’t focus on the romantic elements of the story quite as much as E.E. This left more room for Aza’s concern over the safety of her family and nation (which realistically are and should be bigger concerns) but made it difficult to connect with the love interest. The setting. Fairest is set in the same world as E.E. but in a totally different country. E.E. gave us a sampling of strange cultures all around the familiar quasi-medieval Kyrria, but Fairest focuses on Ayorthia and their singing culture. This was one of my favorite things about the book. This book also shows some aspects of gnomic culture that we didn’t get to see in E.E. The antagonists. This book is full of antagonists. Sometimes it seems like everyone in the world is against Aza, and it makes perfect sense. The main antagonist is interesting and compelling. She has some traits in common with Aza but others are completely opposite, allowing an even deeper exploration of the central themes. The themes. As an adult, I think the themes are a little heavy-handed sometimes, but I never noticed as a teenager. Because of the way the themes are embedded in the plot, they don’t come across preachy, just strong. If there had been some other subplots or a stronger romantic plot to round out the story, they would have been a little less conspicuous. Whether that's desirable in a book for this age group, I can't say for sure. 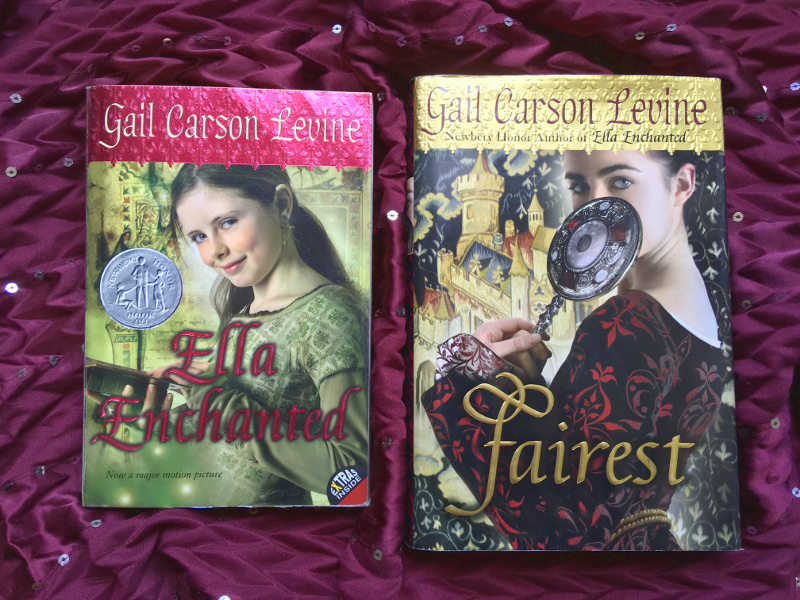 I thoroughly enjoy Fairest, but if it wasn’t a companion novel to Ella Enchanted, I probably wouldn’t still have a copy of it. For me, this is a solidly five-mustache book. While writing this review I discovered that Ogre Enchanted, another book in the same world, is coming out on October 16th! Weird as it may sound, this twenty-four-year-old is totally stoked to read it. Gail Carson Levine also has a number of other books including a ton of fairy tales, two books on writing, and even a book of false apology poetry. She’s also been blogging about writing since 2009. Small wonder she made me want to become a writer. Have you read Ella Enchanted? Fairest? What did you think of them? Are there any other books you'd like me to read and review? Leave a comment below or my hairless ghost lemur will haunt your dreams.